Should I use Snore Defense if I have apnea or another medical condition? After how much time does Snore Defense start to work? Do I need some set up? How long can I expect Snore Defense to last? Is it OK to breathe through my mouth while using Snore Defense? Can I open my mouth while using Snore Defense? Is Snore Defense going to fit in my mouth? What is Snore Defense made of and is it the material safe for me? Is it safe to use Snore Defense, if I have Dentures? Is it possible to have jaw soreness? How to keep my Snore Defense clean? How do I store my Snore Defense? Experts that prescribe anti-snoring mouth-guards to people who snore say that around 93% of them no longer have such complaints . However, individual results are different. What does the FDA Clearance mean? Oral anti-snoring devices are regulated by the FDA and have to be produced according to certain requirements. To be cleared by the FDA, a product has to prove its safety through a series of tests. Anti-snoring devices are sold online without clearance from the FDA, and there is no guarantee for their safety. As Snore Defense has obtained clearance from the FDA, it is perfectly safe and effective for all consumers. Please consult a physician if you have apnea, breathing difficulty or any other medical condition that can be influenced by the use of Snore Defense. Results should be seen the first time you use it. No set up is required. You can start using it as soon as you open it. It is individual, but many users report that Snoring Defense can be used for a very long time. Yes! Snore Defense enables you to breathe completely naturally through your mouth and nose – not like most other products. It has special breathing holes. Generally using products that obstruct breathing is not recommended. Yes, our "Air Spring Base" technology lets you do that! Moving your mouth while sleeping is common and Snore Defense gives you the chance to move your jaw. Snore Defense is produced in a way that is guaranteed to fit nearly everyone. There is no need of boiling or adjusting of any kind - just use it as directed. However, if you want, you can always trim your Snore Defense in order to make it more comfortable. Should you do that, use a fingernail file or emery board to level any rough edges and prevent irritation to the gums. 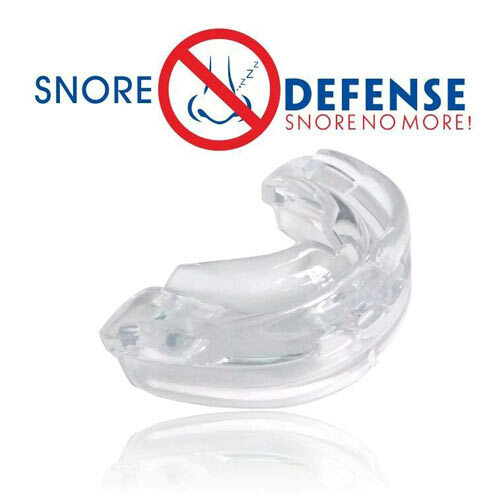 Snore Defense is produced from thermoplastic elastomer made to meet FDA compliance.The material has undergone consumer safety testing and does not contain latex or BPA (Bisphenol A). No. Do not use Snore Defense if you have full dentures. Some time is needed for adjustment – from a few hours to a few weeks - to reach maximum comfort. During that time it is possible to experience some discomfort. Once you remove Snore Defense all of this should pass. Moving the jaw forward is what prevents snoring. This will cause some initial adjusting of your jaw muscles. It is recommended to use water with mild dish soap. It is best to use a toothbrush. Be careful not to use other cleaners, as they tend to alter the surface of the device. Rinse thoroughly to remove all soap prior to storage. Always store Snore defense in your supplied case. In this way it will retain its original shape and also will avoid accidental damage. Contact our customer service online support, working 24 Hours a Day, 7 Days a Week!